Carerina Narvaez-Jimenez, 28, of Ardingly Drive, Goring, was fined £60 and must pay £30 victim surcharge, £85 costs, after being found guilty of failing to identify a driver when required by police in Shoreham on October 3, 2017. Her driving record was endorsed with six points. Alastair Gorton, of Surrey Street, Arundel, was fined £600 and must pay £60 victim surcharge, £85 costs, after admitting driving over the 30mph speed limit the A23 Purley Way, Croydon, on July 8, 2017. 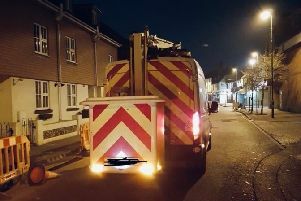 He was fined £660 and must pay £66 victim surcharge after admitting failing to identify a driver when required by police in Shoreham on August 4, 2017. His driving record was endorsed with a total of 11 points. Gabriella Heffer, 27, of Oaksheath Gardens, Worthing, was fined £146 and must pay £85 costs, £5 vehicle excise back duty, after admitting using an unlicensed vehicle in Patcham on November 14, 2017. Jaroslav Meckovskij, 34, of Broadwater Road, Worthing, was fined £146 and must pay £30 victim surcharge, £85 costs, after admitting driving over the 40mph speed limit on the A27 Upper Brighton Road, Lancing, on October 20, 2017. Shantel Boothe, 24, of Crescent Road, Worthing, was fined £40 and must pay £30 victim surcharge, £100 costs, after admitting driving over the 60mph speed limit on the A24 West Grinstead on October 7, 2017. Her driving record was endorsed with three points. Jonathan Araromi, 20, of Rushton House, Albion Avenue, Lambeth, was fined £185 and must pay £30 victim surcharge, £85 costs, after admitting possessing heroin, a Class A drug, in Tarring Road, Worthing, on August 3, 2018. He also admitted possessing crack cocaine, a Class A drug, in Tarring Road, Worthing, on August 3, 2018, no separate penalty. Michael Chappell, 30, of Daniel Close, Lancing, was fined £40 and must pay £30 victim surcharge, £85 costs, after admitting disorderly behaviour while drunk in Primrose Close, Littlehampton, on August 1, 2018. Robert Johnson, 33, of Orchid View, Stanmer Heights, Brighton, must pay £350 compensation, £85 costs, after admitting causing £350 damage to a conservatory door panel in Worthing on July 31, 2018. Josh Jones, 23, of Queen Street, Broadwater, was fined £75 and must pay £30 victim surcharge, £85 costs, after admitting disorderly behaviour while drunk in Brighton Road, East Worthing, on August 3, 2018. David Lambert, 68, of Canada Road, Arundel, was fined £65 and must pay £30 victim surcharge, £85 costs, after admitting driving over the 40mph speed limit on the A281 Long Hill, Lower Beeding, on November 4, 2017. His driving record was endorsed with three points. Liam Palmer-Kearns, 43, of Brighton Road, Shoreham, was discharged conditionally for two years and must pay £750 compensation after admitting stealing various items of tiling goods, including adhesive and grout, worth £1,511.90 from Hampshire Tile Warehouse, Southwick, between April 27, 2017, and May 11, 2018. Harry Best, 24, of Hinchcliff Drive, Wick, was given a nine-week prison sentence, suspended for 24 months, and must pay £500 compensation after admitting sending an electronic message that was grossly offensive or of an indecent, obscene or menacing character on May 17, 2018. He was given a 12-week consecutive prison sentence, suspended for 24 months, and must pay £100 compensation after admitting assault by beating on April 19, 2018. He was fined £145 and must pay £115 victim surcharge, £300 costs, after admitting damaging a television and furniture on February 11, 2018. He was fined £145 after admitting destroying a picture frame, ornament and glass bowl on April 19, 2018. He must pay £100 compensation after admitting assault by beating on February 11, 2018, no separate penalty. He was also given a restraining order. Joshua Hansford, 20, of Ten Acres, East Worthing, was given a community order with Rehabilitation Activity Requirement and must carry out 100 hours’ unpaid work after admitting two charges of assault by beating in Worthing on February 24, 2018. He must also pay £85 victim surcharge, £300 costs. Deborah Wiltshire, 22, of York Road, Littlehampton, was fined £54 and must pay £30 victim surcharge after admitting being drunk and disorderly in Wick Street, Littlehampton, on April 11, 2018. She also admitted breaching a suspended sentence order and was dealt with for the original offences, receiving an eight-week prison sentence for assault by beating in Littlehampton on September 4, 2017; two eight-week concurrent prison sentences for assaulting a police constable in the execution of his duty on September 4, 2017; an eight-week concurrent prison sentence for assault by beating in Littlehampton on September 4, 2017; and an eight-week concurrent prison sentence for assault by beating in Littlehampton on May 24, 2017. Jake Denyer, 24, of Maybridge Crescent, Goring, was fined £80 and must pay £60 costs, after admitting breaching supervision requirements following release from prison by failing to attend appointments on March 23, 2018; June 27, 2018; and July 24, 2018. Santino Naddeo, 23, c/o Downsway, Southwick, was fined £50 and must pay £60 costs after admitting breaching a community order by failing to attend RAR sessions on July 17, 2018, and July 24, 2018. Tyrone Rogerson, 33, of Old Shoreham Road, Shoreham, was fined £100 and must pay £100 costs after admitting breaching a community order by failing to attend RAR sessions on June 28, 2018, and July 25, 2018. Kieran Denver, 45, of Alderney House, St Catherine’s Road, Littlehampton, was given a six-week prison sentence, suspended for six months, and must pay £115 victim surcharge, £85 costs, after admitting possessing cannabis resin, a Class B drug, in Littlehampton on July 21, 2018. He also admitted being drunk and disorderly in Surrey Street, Littlehampton, on July 21, 2018. Annette Law, 50, of Middle Mead, Littlehampton, was given a community order with Rehabilitation Activity Requirement and fined £50 after admitting failing to promptly notify Arun District Council of a change affecting Housing Benefit in Littlehampton between September 5, 2016, and December 17, 2017. She must also pay £85 victim surcharge, £85 costs. Derek Cook, 51, of Chester Avenue, Worthing, was fined £80 and must pay £200 compensation, £30 victim surcharge, £85 costs, after admitting causing £200 damage to entrance doors at the Grand Victorian Hotel, Worthing, on July 22, 2017.